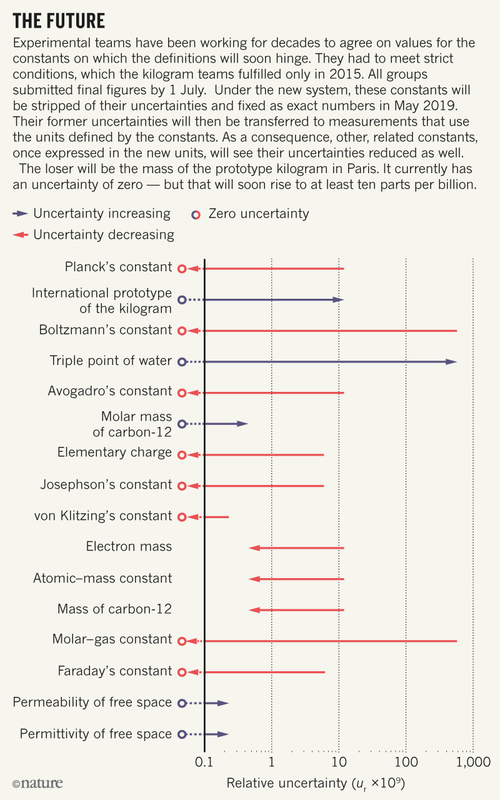 Official metal kilogram relinquishes its role to constants, but won’t yet retire — and more changes to scientific units are set to come. 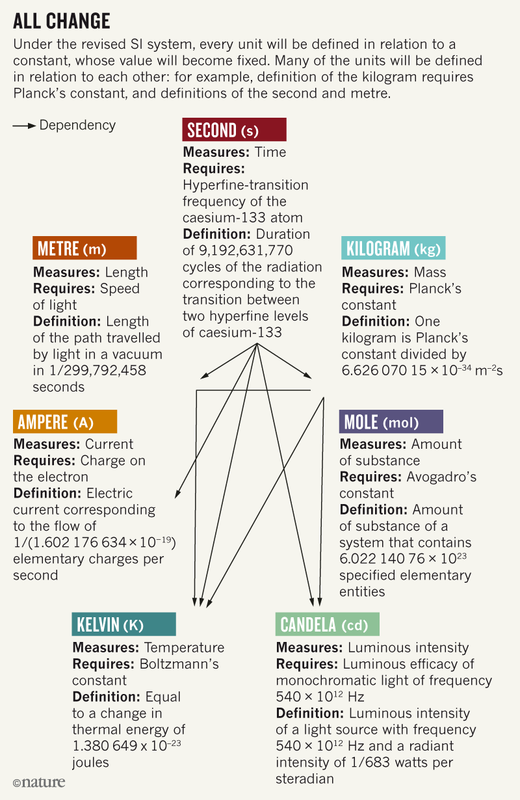 In the biggest overhaul of the international system of units since 1875, countries have voted to redefine four basic units of measurement — the ampere, the kilogram, the kelvin and the mole. At a meeting on 16 November, 60 delegates from governments around the world voted unanimously to change how these units are defined — which will come into force on 20 May 2019. The vote at the intergovernmental General Conference on Weights and Measure in Versailles, France, was met with standing ovation and champagne. Under the new International System of Units (known simply as SI), all measures will be described using fundamental constants of nature and be derived through experiments, severing the last links between the SI and physical objects or arbitrary references. The move allows units to be generated from their definition anywhere in the world, and remain unassailably stable. The vote is the culmination of decades of work, and a triumph for metrologists. 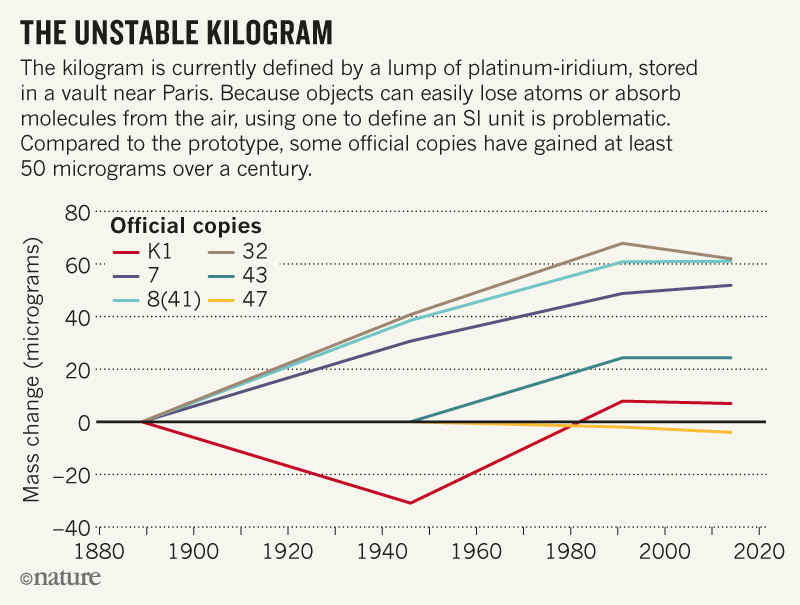 It means that the antique, palm-sized cylinder of metal ‘Le Grand K’, which resides in a vault in Sèvres, on the outskirts of Paris and has defined the kilogram since 1889, will lose its special status. But these milestone changes do not mean that the wider SI system is now perfect, says David Newell, a physicist at NIST. Metrologists will next work to improve the definition of the second, and potentially add more units to the system. “It’s like at the end of the Harry Potter series. Good triumphs, but everything’s just trashed,” says Newell. In the SI, “there’s still a whole load of mess that still needs to be cleaned up”, he adds. Measurements must always be made against a reference, and standard references are used to ensure that units are comparable and consistent across the world — from measuring milligrams of drugs to the timing of Global Positioning Systems. For mass, this means that every measurement must be traceable back to the kilogram in France. The idea to base all units in relation to constants of nature — being unchanging and belonging to no one country — has been around since the late nineteenth century. But it has taken almost 150 years for scientists to measure the values with enough accuracy to do so. 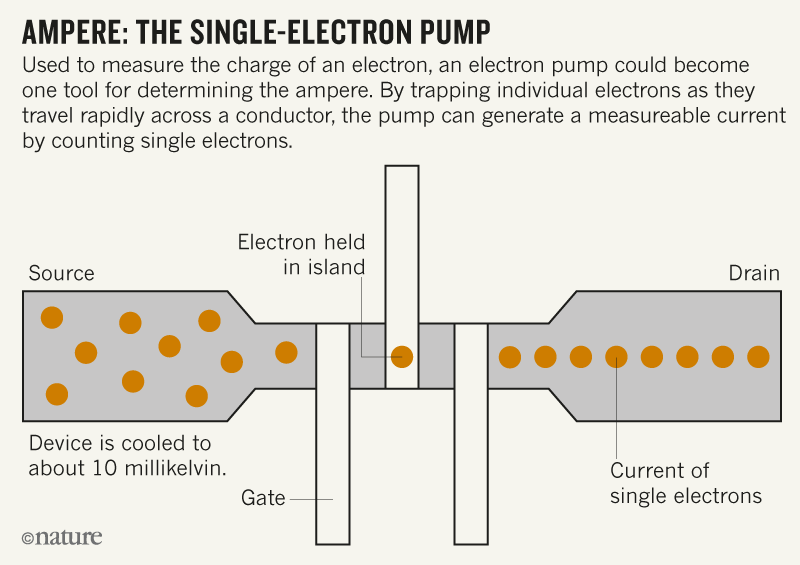 Metrologists working on electricity have refined experiments that count the flow of individual electrons, allowing them to use the charge on a single such particle to determine the ampere — replacing a definition that is based on a hypothetical experiment involving two infinitely long wires. This quantum redefinition brings the SI into line with the electrical community, which has used such standards since 1990 owing to their greater accuracy. 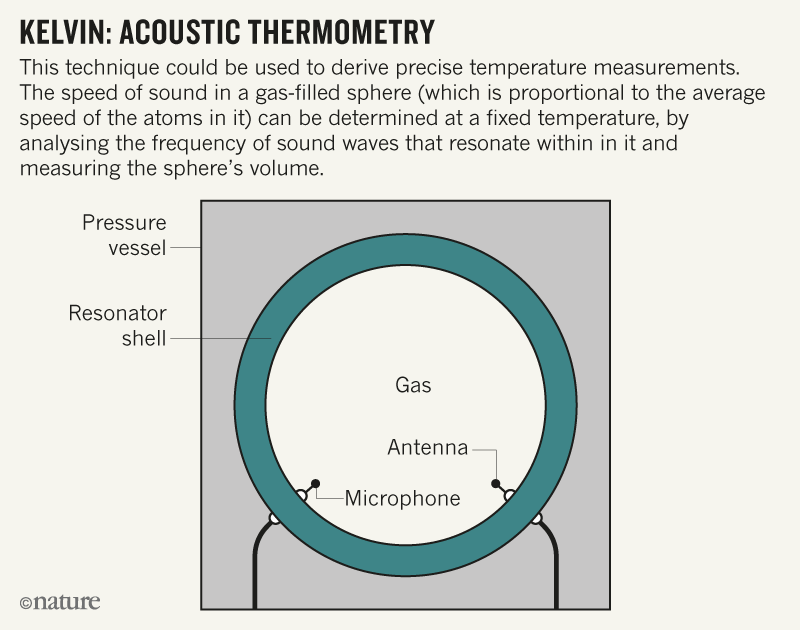 The kelvin will soon be defined by the Boltzmann constant, which links energy and temperature, rather than in reference to conditions at a specific temperature of water, known as the triple point. 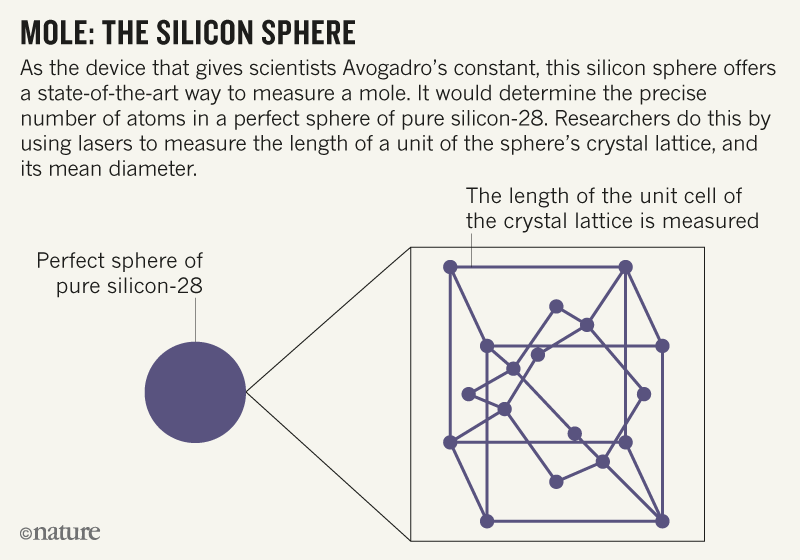 Meanwhile the mole — a measure of substance that has long been equivalent to the number of atoms in 0.012 kilograms of carbon-12 — will soon equal Avogadro’s number. In the case of the kilogram, redefinition meant measuring Planck’s constant, a number that defines the size of packets of energy at the quantum scale, with exquisite precision. 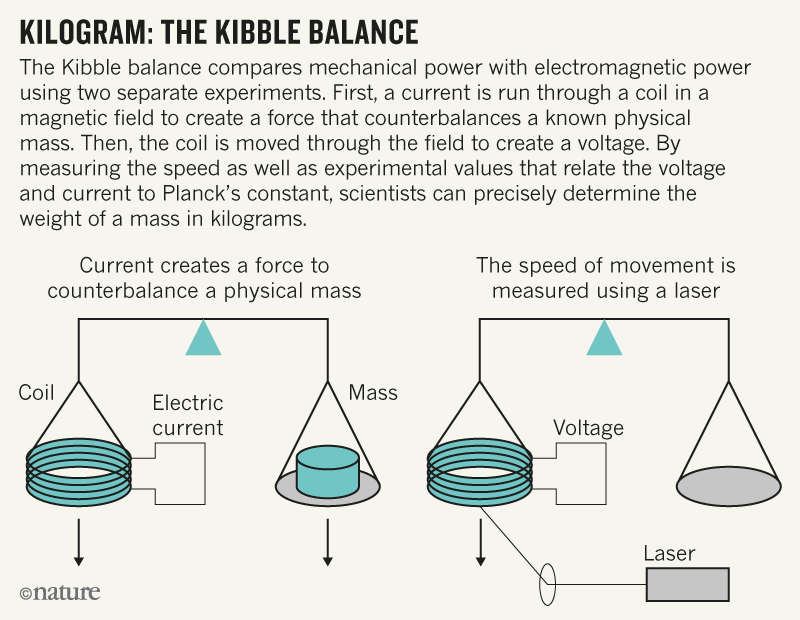 One method, known as a Kibble balance, derives Planck’s constant by weighing a known mass against an electromagnetic force (see ‘Kilogram: The Kibble balance’). Another counts the atoms in two spheres of silicon-28 to derive a value for Avogadro’s number, which is converted to Planck’s constant. Teams applying the two different methods only reached values that were accurate and in close enough agreement in 2015. “The fact that they agree to a few parts in 10 million is absolutely extraordinary, as they are definitions based on completely different areas of physics,” says Quinn. The constants will be fixed at their agreed values — as the speed of light was when it became the basis of the metre’s definition in 1983. To derive the units, metrologists will flip the experiments used previously to obtain the constants — for example, using a fixed value of Planck’s constant in a Kibble balance to determine the electromagnetic force and weighing that against an unknown mass. This value has been fixed not only in the SI system, but physically on metrologists at NIST, a number of who recently tattooed Planck’s constant on their forearms. Because physical artefacts are vulnerable to being lost or damaged, the change makes the mass definition more reliable. Although Le Grand K has, by definition, always weighed exactly 1 kilogram, its mass has changed slightly relative to copies (see ‘The unstable kilogram’). It has been impossible to say whether Le Grand K loses or gains atoms, but future studies should now reveal that. A beauty of the system is that any experiment — once international comparisons have shown it to be accurate — can be used to determine the unit, says Estefanía de Mirandés, a metrologist at the BIPM. This not only makes the system more democratic, it also ‘future-proofs’ the definitions, so that they can be used with newer, more-precise experiments in the future, she says, potentially unlocking new technologies. Already, it allows measurements of very large and very small masses with much greater precision than today, she explains. Mass metrologists cannot run straight into this brave new world. Although agreement between experiments was good enough for the redefinition, it is not perfect. Until slight disagreements between the world’s best mass measurements are resolved, the BIPM will act as an arbiter. It will ask each group to measure the same objects, and come up with average mass values against which the world can compare. Ironing out the disagreements might take 10 years, says de Mirandés. Even at this point, the precious physical weights held by national measurement laboratories around the world will not be thrown away. So few labs have the necessary equipment to realize a kilogram from scratch, that the weights take up roles transferring mass standards from national laboratories such as NIST to industries that require them, such as aerospace and biotechnology. “The babies are still my babies and nobody touches them,” says Kubarych, who oversees the copies in the United States. 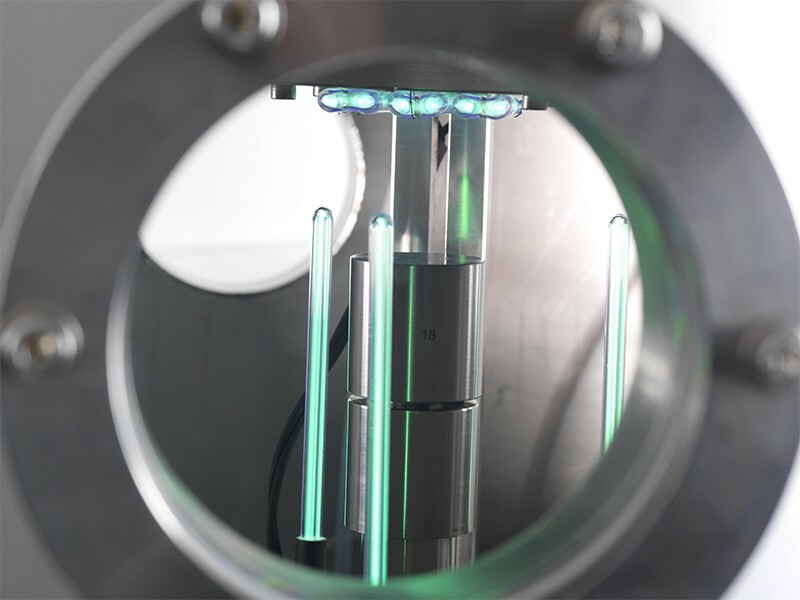 NIST and national laboratories in the United Kingdom and Germany are all working on cheaper, table-top Kibble balances so that companies and smaller laboratories might one day be able to realize masses themselves. Redefinition has consumed metrologists since at least 2005. Next in their sights will be the second, currently described in relation to the frequency of microwave light absorbed and emitted by caesium-133 atoms. These atoms are now surpassed by ‘optical clocks’, which use different atoms that interact with higher-frequency visible light and seem to be able to keep time with less error: just 1 second over the age of the Universe. 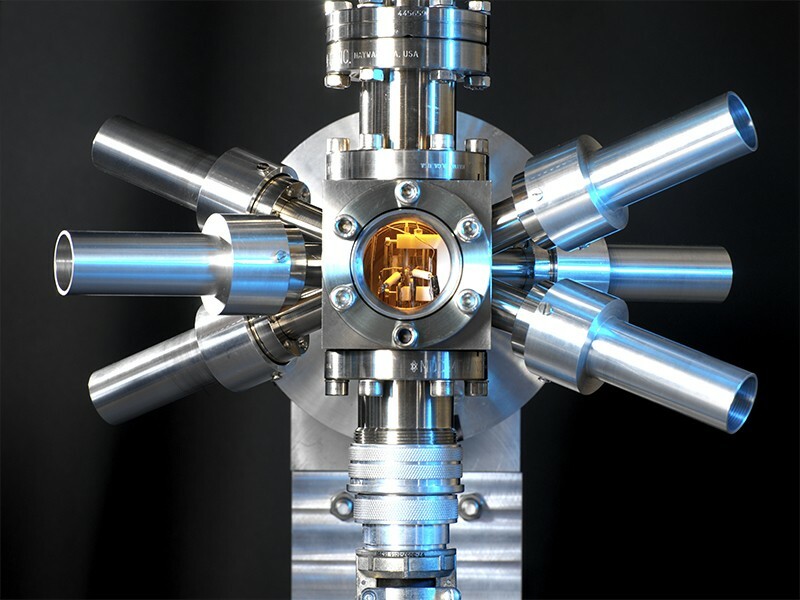 To update the definition of the second in 2026, as many metrologists hope, the community will need to develop methods to compare optical clocks around the world and decide which atom, or atoms, to use as the standard. “That will be a political football,” says Newell. Another bugbear that metrologists might try to resolve is finding a smoother way to include dimensionless quantities — such as radians, the ratio of the length of an arc of a circle to its radius — in the SI system. “In some communities, there’s a huge push for that,” says de Mirandés. Correction 16 November 2018: The headline of this story originally misstated when the last major overhaul of scientific units took place. It was in 1875, not at the time of the French Revolution.